Bones and obesity. Why exercise is the answer? This week we look at an article regarding the role of the bones as endocrine organs. It was published last month from the University of Columbia. The same group of researchers in 2007 identified another bone secreted hormone “osteocalcin” which relates to energy metabolism. 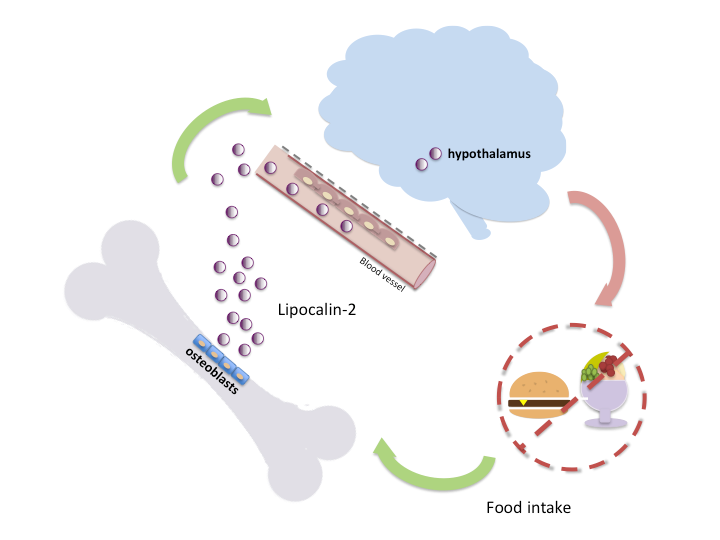 This time they discovered that the hormone Lipocalin-2 activates brain neurons affecting appetite suppression. “In recent years, studies at CUMC and elsewhere have shown that bone is an endocrine organ and produces hormones that affect brain development, glucose balance, kidney function, and male fertility,” says study leader Stavroula Kousteni, PhD, associate professor of physiology and cellular biophysics (in medicine) at CUMC. “Our findings add a critical new function of bone hormones to this list — appetite suppression — which may open a wholly new approach to the treatment of metabolic disorders.” Scrolling towards the bottom of the article, you will read: “The study findings, which reveal a new mechanism for regulating food intake and blood sugar, could lead to the development of new treatments for obesity, type 2 diabetes, and other metabolic disorders.”. My interpretation is that loading the bones (exercise/physical activity) keeps them healthy. This should be our main focus. Now we can safely add bone metabolism and hormone secretion to the long list of benefits from physical activity. I suggest while the researchers study this connection further, we took action to keep our bones healthy..